Whether you are working, raising children, or changing professional pursuits, you can complete your undergraduate degree at Ramapo College of New Jersey through our innovated and focused degree completion programs. Through a combination of on-line and classroom study, our accelerated majors allow you to earn your undergraduate degree in as little as two years. Our degree completion programs enable graduates to gain the perspectives and skills needed to succeed, advance, or re-enter the workforce. 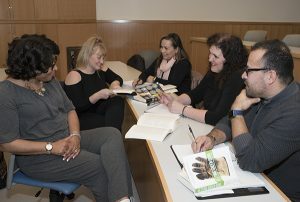 Ramapo’s accelerated Social Science major combines courses in criminal justice, substance abuse, human rights, and other topics of pressing social concern into a coherent whole. Upon completion of this degree, you will be prepared to reenter the workforce or seek job advancement in fields as diverse as paralegal studies, law enforcement, human resources, and related fields in law, justice, and public health. Our accelerated concentration in Professional Communication focuses on how information is created, managed, distributed, and consumed. Students in this program engage in coursework in three key areas: Business and Non-Profit Communication, Written Communication, Visual Communication; and Persuasion and Oral Communication. With this degree, you will be prepared for careers in fields as diverse as public affairs, advertising, marketing, as well as opportunities in business, government, and non-profit administration. Are Social Science or Professional Communication not a fit for you? We also offer customized degree completion options in over 40 traditional majors. We will work with you to find a program that meets your needs and lifestyle. Explore more degree completion options. Ramapo College students, faculty and staff are eligible for a 30% discount on full- and part-time childcare at the Y’s locations in Franklin Lakes and Mahwah. For more information, please contact Debbie Perini at 201.891.2081 ext. 105 or debrap@wyckoffymca.org.